Hurricane and typhoon prediction centers have documented over two decades of steady improvement in tropical cyclone track forecasts, attributing this success to better guidance from global atmospheric models. Similar improvements for tropical cyclone intensity remain elusive. Scientists from the U.S. and China published new results in Nature Communications on 8 March 2016 that will help improve intensity forecasts of hurricanes and typhoons nearing landfall. Forecasts of these final hours before landfall drive storm surge impact models, marking when the reduction in uncertainty is most critical for human populations needing to plan appropriate responses. 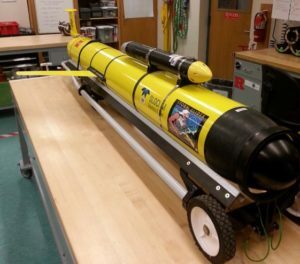 Scientists at Rutgers University conducted the study using satellites imagery, a CODAR High Frequency (HF) Radar network, and an autonomous underwater Slocum glider fleet operated by the Mid-Atlantic Regional Association Coastal Ocean Observing System (MARACOOS). 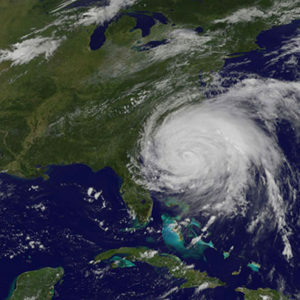 They investigated the rapid de-intensification of Hurricane Irene in 2011 as the storm made its final landfall in the heavily populated Mid-Atlantic. While Hurricane Irene’s track forecast was accurate well in advance, the significant over-predictions of intensity, and the unrealized warnings of severe storm surge impacts, resulted in costly and unnecessary evacuations. This led to future skepticism of similar warnings issued for Hurricane Sandy’s destructive storm surge the following year. Tropical cyclone intensity depends on interactions with the ocean, where intensity is increased by warmer and decreased by cooler ocean waters. Scientists discovered that the two-layer coastal circulation forced by the strong winds on the leading edge of Irene enhanced mixing and cooling ahead of Irene’s eye. Atmospheric model sensitivities indicate that the rapid ahead-of-eye cooling of the stratified coastal ocean was the missing contribution required to match the observed rapid decay in Irene’s intensity. In contrast, Hurricane Sandy, a late October storm, crossed a continental shelf that had already transitioned to well-mixed fall conditions, resulting in little cooling and no reduction in intensity. The 30-year NOAA buoy record was then used to confirm enhanced ahead-of-eye cooling in the 11 hurricanes that crossed the Mid-Atlantic’s stratified coastal ocean in summer. Chinese colleagues identified similar ahead-of-eye cooling and rapid de-intensification in Super Typhoon Muifa as it crossed the highly stratified Yellow Sea in summer. The study demonstrates the scientific value of sustained long-term observations with remote and autonomous systems that provide broad spatial coverage and can both safely and reliably operate in tropical cyclones. It further underscores the need for hurricane forecast models capable of resolving coastal ocean processes as hurricanes approach landfall.